It is not clear what the title refers to; it is said to relate to Tenvoorde, owner of the 10-4 Ranch. 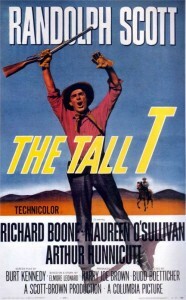 At one time the working title of the movie was “T for Terror” (see the trailer on the DVD). He hitches a ride on a stagecoach driven by old friend Ed Rintoon (the excellent Arthur Hunnicutt) that is hijacked at a way station by Frank Usher (Richard Boone) and his two low-life confederates Chink and Billy Jack (Henry Silva and Skip Homeier). They’ve already killed the station manager and his young son and callously thrown their bodies down a well. They soon do the same to stage driver Rintoon. Usher and his gang try to carry out a plan to get a ransom for Doretta Mims, the woman traveling on the stage. Maureen O’Sullivan plays Doretta, the daughter of the owner of the largest copper mine in the territory, who’s just been married that morning to her father’s accountant Willard (John Hubbard)—a scurvy choice for a husband, as he shortly demonstrates. Brennan plans to get away. He ultimately does, and apparently ends up with the woman, too. This was shot with a limited cast and budget in Lone Pine, as were the rest of Boetticher’s westerns with Scott. 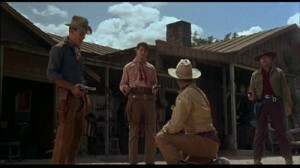 This has a few edges to it, reminiscent of the Mann westerns of the 1950s. It is spare movie-making, with the story told in relatively unadorned fashion in less than 80 minutes. Nevertheless, there’s a lot of interest in the psychology of the characters, as in Seven Men from Now. Richard Boone is great as a not-entirely-unsympathetic bad guy. There’s an interesting balance between Scott and Boone; in some ways, Usher sees Brennan as who he himself might have been in other circumstances. And might still be, only richer with the proceeds of this kidnapping-robbery-murder. Randolph Scott and Richard Boone are great in this. Maureen O’Sullivan, known mostly from her appearances as Jane in the Tarzan movies with Johnny Weismuller in the 1930s, is also very good. Henry Silva and Skip Homeier make reliably nasty henchmen, in different ways. Silva, with his Jack Palance face, went on to make a modest career of playing bad guys (see The Law and Jake Wade and The Bravados). Homeier played a series of kids with guns in the early 1950s (The Gunfighter, Dawn at Socorro), but you can’t do that forever. Sooner or later, you meet somebody faster with a gun, or drift into television parts. Or both. Getting the girl, for once. Note Henry Silva’s cooperative corpse helping Brennan rope his legs to drag him into the hut. 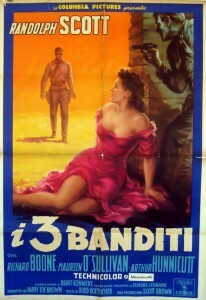 The plot is similar to Rawhide and Man of the West, with regular people being held prisoner by outlaws. From a story by Elmore Leonard (“The Captives”); the screenplay is by Burt Kennedy, as was usual with Boetticher’s better Ranown westerns. 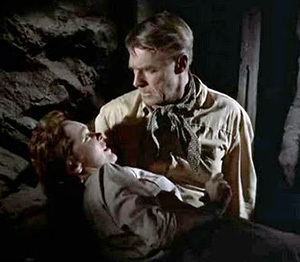 As in Delmer Daves’ 3:10 to Yuma (also from an original story by Leonard), some of the early action takes place in the town of Contention. As with others of the Ranown-Boetticher westerns, this was not generally available until the release of the Boetticher set in 2008, so they have not been seen as widely as they deserve. This is one of the four best of them. 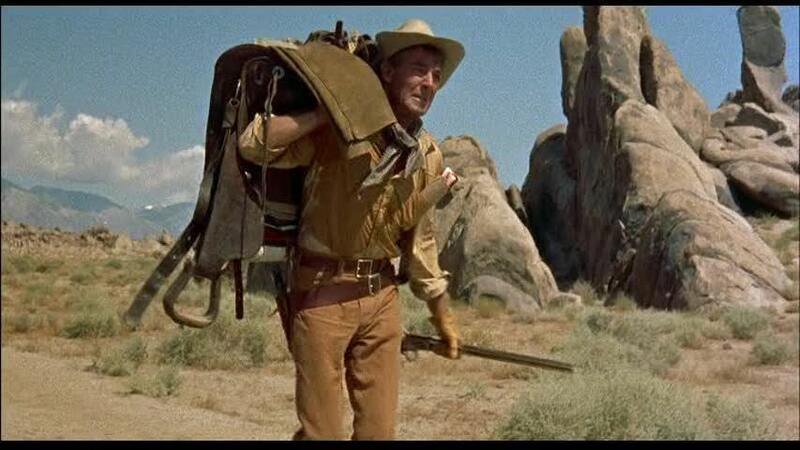 This entry was posted in Westerns Worth Watching and tagged Budd Boetticher, Burt Kennedy, Elmore Leonard, Psychological Westerns, Randolph Scott, Richard Boone on October 17, 2013 by Nicholas Chennault.